Thursday April 28th 1904 I did not feel so very spry today. I did a little too much yesterday. I worked what time I had on a tatting collar for Lib Stevens. Will, Mollie and I went down to the church for supper which was excellent. I did not sleep well last night so went to bed early. 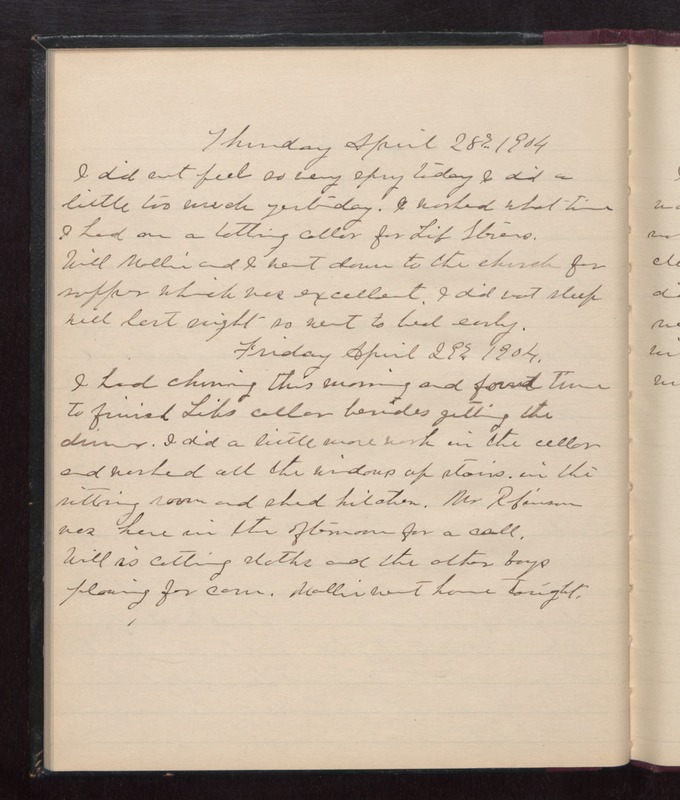 Friday April 29th 1904 I had churning this morning and found time to finish Libs collar besides getting the dinner. I did a little more work in the cellar and washed all the windows up stairs in the sitting room and shed kitchen. Mr Robinson was here in the afternoon for a call. Will is cutting slaths and the other boys plowing for corn. Mollie went home tonight.